Aparna Kanjhlia chose UGA because she was “attracted to its diverse student body population, academic and extra-curricular opportunities and the vibrant town of Athens.” The future doctor wants to eventually practice medicine in underserved communities around the world. I am the first Dawg in my family but it didn’t take too long to convert them into Bulldawg fans! My sister followed my footsteps and is currently a sophomore in the College of Public Health. It’s safe to say that our family proudly bleeds red and black! I was not a traditional undergraduate student. 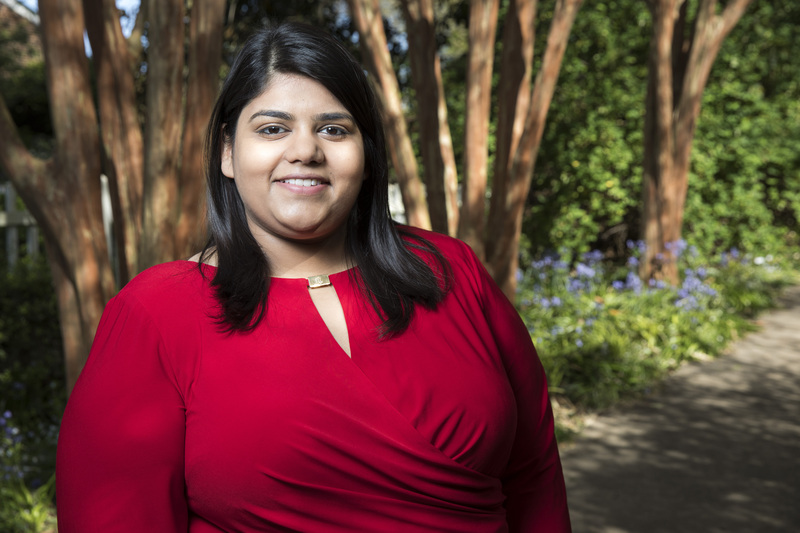 I moved from India after completing my high school education and transferred to the UGA Honors Program after securing an associate’s degree in biology. From the day I walked into my orientation and learned how to call the Dawgs, I have been in love with this institution! The Bulldog family is humungous with even bigger hearts and they welcomed me with open arms. With the diverse opportunities that UGA has given me, I have been able to expand my boundaries, form memories that I will cherish forever and transformed me into an individual with a holistic approach towards life. The Undergraduate Neuroscience Organization has been a pivotal part of my undergraduate life at UGA. I had the opportunity to meet with individuals who shared the same passion for neuroscience as me. Through UNO I have had the honor of interacting with some phenomenal people in the field of neuroscience who are working on cutting edge research. In my junior year, I served as the philanthropic co-chair to raise money for the Michael J. Fox Foundation for Parkinson’s Research. While interacting with families of people with Parkinson’s, I learned so much more about this challenging condition and the importance of having a positive outlook in times of adversity. With their Neuroscience for Kids Program at Barrow Elementary school I have taught neuroscience to some of the smartest third-graders I know. During my senior year, I have had the pleasure of representing this amazing organization as its co-president and being able to host the very first Georgia Collegiate Neuroscience Symposium in collaboration with Georgia State University and Emory University. UGA is unique in its ability to provide its students with a multitude of research opportunities in every department. I have been fortunate to be involved with the Clinical Neuroscience Laboratory under the psychology department. Under the guidance of my P.I. Dr. Lawrence Sweet, I have used fMRI data from brain regions to explore relationships between alcohol consumption and early childhood stresses with impulsivity in young adults. During my junior year, I was awarded the R.A. Assistantship by CURO and presented a poster at the Annual CURO Symposium. Gandhi said, “The best way to find yourself is to lose yourself in the service of others.” IMPACT Service Breaks and VIDA Volunteer are two organizations that are truly based on this foundation. I consider myself extremely lucky to have been a part of IMPACT’s service break trip to St. Louis, Missouri, to advocate for increased awareness about HIV/AIDS, its prevention and learn about its intersectionality with other social issues such as domestic violence, substance abuse, homelessness and poverty. During the spring break of my junior year, I participated in a service-learning trip through VIDA Volunteer to Nicaragua to provide medical care to people in the underserved communities for which I was awarded the HISP Scholarship by the Honors Program. It has been the most self-fulfilling experience of my undergraduate life and has further strengthened my resolve to be a future physician. I wanted undergraduates like me to experience this as well, and for this I took up the position of VIDA’s campus coordinator at UGA. Being a pre-med student can sometimes be stressful. I was always shuttling between science courses, doing scientific research, reading publications or attending pre-med club meetings. To take a break from all that, I joined an organization called Spoon University, a food-based global online publication. It combined my love for food with my enthusiasm to organize events. For the past two years, I have been Spoon University at UGA’s marketing director. I absolutely love going out to try new eateries in Athens, collaborating with them and organizing fun food-related events on campus! If you see someone on campus walking around with a giant life-size spoon, that’s me! I have been a SWAB mentor to try and make Christmas a little more special for kinds living in challenging environments in the Athens community. I also mentor Honors students through the PAL Program. Additionally, I have been involved with MEDLIFE — a wonderful organization for all pre-meds — as a family head this year and served on its mobilization committee for the previous two years. I visited UGA as a part of an open-house session with my family and I knew that this was it! I instantly fell in love with UGA’s expansive campus covered in greenery. It was the perfect combination of modern yet historical. I was attracted to its diverse student body population, academic and extra-curricular opportunities and the vibrant town of Athens! Induction into the Honors Program was only the cherry on top of the cake and I am so grateful for that. Proximity to my family living in Atlanta was also a huge part of my decision to come to UGA. I absolutely love attending events organized by University Union! Whether its Dawgs After Dark or the spring concert, I’m always one of the early ones to secure my spot at these events. Swimming in the Ramsey pool is a close second! I thoroughly enjoy spending some quality time with friends on Lake Herrick. During fall, right before UGA shuts down for winter break, the entire downtown Athens is decorated beautifully with lights and I often find myself enjoying a walk on the busy streets. … to experiment with my tastebuds! In all honesty, cooking is like yoga to me. I love trying to cook new and exciting recipes when I have an evening off from club meetings or not having to study for an upcoming test. Occasionally, I go grab dinner or watch a movie with friends. I am absolutely terrified of heights!! While I was in Nicaragua, my friends convinced me to zipline through the canopies of Granada on one condition — I will always have my trainer by my side. However, my trainer thought the only way for me to get over my fear would be to trick me into believing that he was right behind me when he wasn’t. I was midway when I realized that he hadn’t gotten on right behind me and while I was paralyzed with fear for a moment, I quickly realized that I’ll be OK and that it was a lot of fun. … the science library. I have spent countless hours studying for OChem and BioChem in there. The best part is that you will always end up meeting a friend there and its proximity to Snelling. Dr. Karl Espelie, what would have I done without him! I remember walking into his seminar on my very first day as a transfer student at UGA. He gave me such a warm welcome, not just to his seminar but UGA. It was the first time anybody had done that and it instantly made me feel better. Since then, he has been my mentor and academic advisor. I cannot thank him enough for encouraging me to add psychology as my second major. He always wants the best for his students and loves spending time with them, be it at his office or at The Grit sharing a golden bowl! It was Dr. Espelie who introduced me to Dr. Sylvia Hutchinson. She’s the most amazing human I know. She goes above and beyond for her students. The only regret I have is that I didn’t meet her sooner. I have never met someone as passionate about enabling her students to succeed as Dr. Hutchinson. The joy and pride with which she shares stories about her students is evident when she talks about them. I only hope one day I can be one of those students. Dr. Lawrence Sweet is my PI and I cannot thank him enough for the research opportunities that I have been given. In his lab, I met my research mentor, Emily Hallowell, who is one of the smartest and most hardworking people I know. It was due to their combined efforts that I received the CURO assistantship, presented my poster at CURO and will be completing a CURO thesis before I graduate. Cell Biology with Dr. Julie Stanton is probably one of my favorite classes at UGA. She’s a remarkable professor! She creates an engaging environment that facilitates learning for her students. The coolest thing about her? No matter the size of your class, she will know you by your name by the second week of classes. Dr. Stanton is so helpful and makes cell biology so much fun because of how passionately she teaches. Over time there have been other professors like Dr. Paula Lemons in the biochemistry department, Dr. Chris J. Peterson in the plant biology department and Dr. Billy Hammond in the psychology department who have positively influenced my time at UGA. … my maternal grandfather! My mom lost her dad when she was 15. I’ve grown up listening to stories about his dynamic personality and incredible charm, and I’d love for an opportunity to get to spend whatever little time I can with him. He’d be so proud of my mom for taking care of the entire family at such a young age. I want to share my love for medicine with him and tell him that one of the reasons for me to pursue medicine is him. … find a cure for HIV/AIDS and Parkinson’s! … travel to every part of this world. I would want to set up women’s education centers and free health clinics in rural India. the female literacy rate in India is still below the global average, possibly because women’s education is hampered at different stages. These centers would work with women at the grass-roots level to understand their problems, come up with solutions and make them realize the importance of education. I want to encourage women of all ages to go back to school and learn, so that they can be independent and realize that they’re just as capable as men in their societies. Women’s health is another cause of concern for women in rural India because often they don’t take their health seriously, or they don’t have the money to get themselves treated. At these free health clinics, not only would they receive medical care but also learn about preventive care that they can practice in their daily lives. … take a year off to gain valuable clinical experience before I apply to medical school. Eventually, I want to practice medicine in underserved communities around the world. It would have to be witnessing the total solar eclipse in August 2017, with more than 20,000 people of the Bulldog Nation!